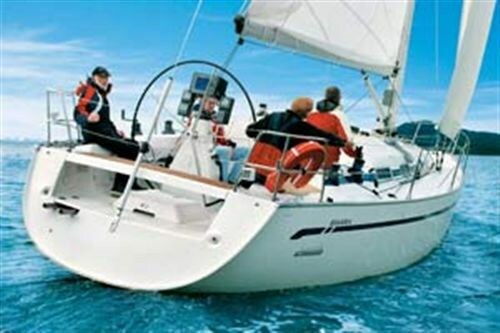 New Zealand's first Bavaria Match 42, Harlequin is everything her name suggests: lively, dynamic - and great fun to sail. But for the competitive sailor, writes Gary Lovell, the mood can be switched instantly - she becomes a seriously-quick racer. The largest boat builder in Europe, Bavaria Yachts has been producing some 3000 yachts per year, ranging from 32 to 50 feet in size. But growing demand resulted in the recent expansion of the factory - all geared to boosting output by another 1000 boats a year. The move follows Bavaria's design overhaul of its range three years ago, and the introduction of three new racer/cruisers - the Match Series. They were an immediate hit. The first - the Match 35 - competed successfully in a number of Mediterranean regattas. It was followed by the Match 38, one of which competed in the 2004 Sydney to Hobart race. Of the 116 yachts that started that race 59 retired because of the extreme conditions created by 60 knots winds. The Match 38 - Cure Our Kids - finished 23rd out of the remaining 57. Another Match 38 - Slipknot - finished the last season in Auckland with a cabinet full of trophies. The owner of the new Match 42, Tauranga's Neville Harlick, is a Bavaria fan, and has upgraded from a Bavaria 40 cruiser. A large, leather-covered wheel is the first thing that catches your eye after stepping aboard the boat. It commands pride of place in the large, open cockpit, and sits just aft of the main traveller and large pedestal. It looks and feels like a racing machine. There's a full-width seat just behind the wheel, and in racing mode, it's easily removed by undoing two, lockdown clips. Under the teak-inlaid cockpit seats are two large lockers. They're easily big enough for a small outboard motor, life raft or inflatable dinghy, plus fenders, mooring lines and other gear. Aft of the wheel is a gas bottle locker, wash down/shower and a fold-up boarding ladder. Clutter-free is the best description of the cockpit, with most of the running rigging returning (via Spinlock jammers) to a brace of Lewmar self-tailing winches (two-speed) on either side of the companionway. Genoa sheets are handled by another set of two-speed, self-tailing Lewmars mounted on the cockpit coamings. Good space on the side decks gives the crew plenty of room for trimming and sail handling, and a lowered toerail aft of the stays make the time spent on the rail a little more comfortable. The bowman is well-protected by a fully enclosed stainless steel pushpit, safety rails and toe rail in the forward sections of the boat. The forward deck is also uncluttered: it features a single, clear hatch for the main cabin. Stainless steel rod shrouds and stays on triple spreaders support the keel-stepped aluminium mast. Mast bend is adjusted by a Hasselfors backstay tensioner - fitted as standard. Although Match series yachts do not come with sails (allowing serious sailors to have sails built to their own specifications), it does come with a Furlex self-furling rig, with the option of dropping the furler and fitting racing headsails in the foil. Hoisting, lowering and reefing the main a breeze with a smooth, battcars and track system. The standard Match 42 comes with a Raymarine Tridata ST 60, with the owners left to fit his choice of other instruments. On Harlequin, Harlick has opted for a two-display Raymarine ST 290 system - one on the mast and the other on the wheel pedestal. A Raymarine ST4000 Auto Pilot unit has also been fitted, along with a Raymarine C80 chartplotter. Down below the Match 42 is a very comfortable cruiser. A U-shaped settee around a superbly-finished table dominates the saloon to starboard. Two batteries are stowed under the settee seats, but there's plenty of additional storage for other items. Aft of the settee is the navigation station, with its half-size chart table and a black plastic console for instruments. Above the chart table is the switchboard. Opposite, to port, the galley takes up the forward section and the head the aft section. Hot water for the galley and shower comes from a 20-litre cylinder supplied by a heat exchanger on the engine. The galley is a straight bench incorporating a two-burner gas cooktop, oven, sink, fridge and separate icebox. Plenty of storage above and below the bench top comprises lockers, open shelves and a bank of drawers. Harlequin's fitted with a holding tank. 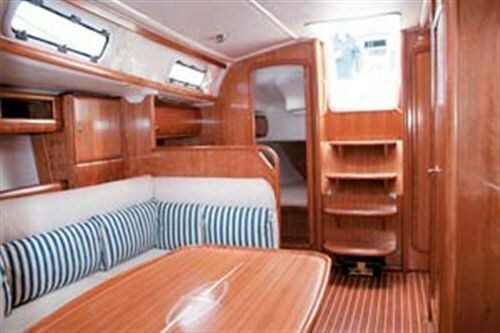 The new, light-coloured mahogany panelling gives the interior a brighter feel than earlier Bavaria models, and I predict this décor will be more popular with New Zealand yachties. It's complemented by a cabin sole of psuedo teak and holly and again, I feel is a great improvement on the product used in previous models. Two double cabins take up the space aft of the saloon, one either side of the engine. They are both roomy with good head height considering where they are, and incorporate a shelved locker and open shelves along the berth. A water tank to port and a diesel tank to starboard are situated under the berths. Removable panels on the sides of the lift-up companionway stairs gives excellent access to the front and sides of the engine. A sensible feature is a rack to hold the washboards once they've been removed from the companionway - much better than leaving them on one of the rear berths. The forward cabin is the conventional double berth with plenty of room at the entrance. It contains a small seat and a double locker - one with shelves and the other a hanging locker. Under the forward berth is a second water tank. Our first bit of serious sailing on Harlequin came with her delivery voyage from Auckland's viaduct basin to Tauranga. Under engine she cruised along at nearly 8 knots, with the 55hp Volvo humming along quietly at 2200 rpm. Increasing the revs to 3000 rpm saw boat speed climb to just over 9 knots. In light winds (7 -10 knots) we hoisted the main, unfurled the headsail and immediately felt Harlequin come to life as we trucked along very nicely at 6 - 7 knots under cracked sheets. Any increase in wind speed was rewarded with a nearly instant build in boat speed - she is very responsive. And in that spacious cockpit, sail trimmers have plenty of room for adjustments. As the breeze built we developed a respectable heel and an increase in boat speed - at 12 knots of true wind we were up to 7 - 8 knots. At 15 knots of wind we decided to throw a reef in the main and furled a small amount of head sail, more for the practice than any great need. We were rewarded by a slight increase in boat speed and a little less heel. In winds of about 18 knots (gusting to 21 knots) the boat achieved consistent speeds of 9.5 to 10.5 knots and a top speed of 11.5 knots. We didn't have the opportunity to fly a spinnaker as the new pole had not been delivered. Harlick's very keen to get her out on the race track to test her performance against the competition, and I'm picking his smiles will be as wide after the first few races as they were when he first set eyes on her. He intends to race her in the Tauranga Yacht and Power Boat Club summer races and in the northern coastal races and regattas. Her first outing out of Tauranga will be to the Legends Regatta on Labour Weekend. 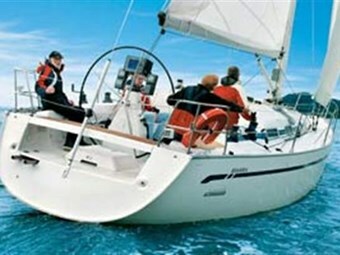 Bavaria yachts are imported into New Zealand by International Marine Brokers, Auckland.